In the interests of being comprehensive, now that I've seen them, I can happily say that, for me, 'Slumdog Millionaire' is one of the year's best films, and 'Frost/Nixon' is not. 'Slumdog' is an astonishing array of Bollywood parody/homage mingled with a story of childhood trauma that bears comparison with 'City of God' or 'Schindler's List' and one of the most interesting treatments of 'money doesn't conquer all but love might' I've ever seen. My first viewing was colonised by the fact that the movie has been marketed as a feelgood fantasy, when in fact it plumbs the depths of modern day child slavery, and features, about forty minutes in, one of the most distressing images I've ever seen in a film; the rest of the film could not recover. This was a good thing, an indicator of how powerful the first act had been. I returned a couple of days later, partly because I wanted to get the distressing parts of the film out of my system, partly because I knew it deserved a second look. Going in knowing the emotional terrain of the movie meant that I didn't spend most of its running time squirming; and ultimately I found it utterly exhilirating. Danny Boyle has fused the rapid fire editing chic of 'Trainspotting' with a Simon Beaufoy script about globalisation, poverty, how the largest city in the world swallows up the most vulnerable, and the power of a TV show to monopolise the public imagination. There's even a bit of comment about religious sectarianism, and a glance cast at Islam - I'm not sure this is entirely successful, as it's not clear on first viewing just what is being said - but this might be the point: Boyle and Beaufoy are just showing us what Mumbai is like, not telling us what to think, except when it comes to how consumerism, at best, is its own reward; at worst, it kills people. 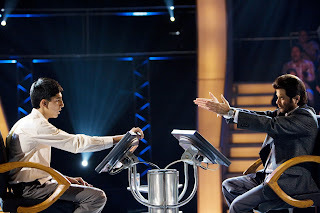 'Slumdog Millionaire' is a magnificent film. 'Frost/Nixon', on the other hand, is a well-directed story that I have seen before. Lovely to watch the actors - Michael Sheen and Frank Langella in particular - do their thing, but I felt that there was less to this than the sum of its parts. Presidents are vulnerable human beings too; interviewers have mixed motives. But - and I'll go out on a limb here - I've always been a defender of Ron Howard, and will continue to say that he knows how to make entertaining movies. If someone could erase 'A Beautiful Mind' from the lexicon of film history I'd make that statement even stronger. i am so glad you enjoyed Slumdog Millionaire. When i first saw the preview i was not really all that into it, but then i read up on it more and became intrigued. We saw it yesterday with some friends and thoroughly enjoyed it. Slumdog was amazing... I agree that the way it was marketed was not the best choice. Based on the preview, I didn't have much interest in seeing it, but I'm glad I did. I on the other hand rather enjoyed Forst/Nixon. Both films made my 2008 top ten list. Also Gareth, I am dying to hear what you think of Gran Torino. You and I share similar views on violence and this film has a ton to say regarding that topic. I'm anxious to hear what you think. I heard somewhere else that Slumdog Millionaire was really good, and now I'm really determined to see it. However, it might be hard to find a copy in China... Anybody know of a legal (paid) download site that might have it? I speak to and facilitate groups on a range of topics - my interests include understanding violence and practising non-violence, peace-building and addressing conflict, film & television and spirituality, theology and sexuality, and other questions of radical Christian spirituality. From small-group facilitation to large plenary gatherings, I try to bring a distinctive style and practical experience of working in northern Ireland and of postmodern Christian spirituality and practice. Email garethspeaks@hotmail.com to get the conversation going.